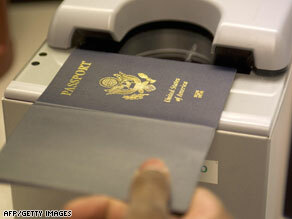 U.S. passports issued since August 2007 contain an RFID chip. So last week I saw this post on Gizmodo about this dude who rigged up an RFID reader and an antenna and drove around looking to clone the chip in people’s passports. The scary part? It worked, and quite easily. Using radio waves, a RFID reader collects electronic data encoded in tags attached to products or people, such as the chips that marathon runners wear to record their race times. Of course, what a thief could actually do with other people's passport information will be open for debate. But it still begs the question: Why do I need this chip in my passport? Supposedly it’s to help make the process of checking for terrorists quicker. But if the number is so easily cloned, doesn’t that defeat the purpose? You can read the State Departments FAQ on the RFID-equipped passports here. Can’t wait to hear what you guys think about this. btw- I just watched the video. He is not detecting passports with that Matrics reader (it's a UHF reader, btw). The govt has a different sort of study going on for ID cards, and that's what he's talking about. You'll notice he doesn't show you his passport, and mentions that only a few people have these tags (his supervisor). This particular video is really misleading, because this person doesn't show the viewer what kind of tags he's reading. He mentions a lot of things callously, but it's really nonsense if you know what he's talking about. True, it's trivial to clone tags. You can think of these particular UHF tags to be similar to blank floppies. You just write a 64 or 96-bit piece of data on there, and that's it. There's no way this will be used for any sort of ID until encryption is added to the tag protocol. Security is obviously a major issue with this type of system. More development is being done to integrate security features, but you won't see them for a while. Of ID theft would be a major concern with the RFID passport. But also personal security. If your bus gets hijacked, criminals may wish to isolate the Americans. That might be a bad time to have a little chip identifying you as a target. 1) You are walking through a market in the middle east. Some terrorist in the crowd now can find out who all the Americans are by simply scanning for passports with a certain unique response. They don't care who you are or what your details are, just that you are American. 2) Similar to the above but now you are in Mexico and 'they' are looking for someone to kidnap. Guess who makes the short list? There are no assurances that can be given that would make my "OK" with this 'technology'. Shouldn't it be called Google Mars?